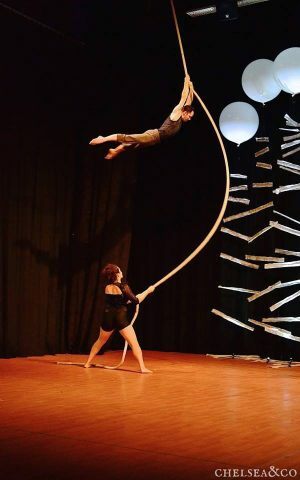 Acrobatic Conundrum, Seattle’s premier contemporary circus arts company, is led by Artistic Director and Co-founder, Terry Crane who has been described as an expert at vertical rope and practitioner of capoeira, contact improvisation, hip-hop dance, physical theater, and tree climbing. The ensemble-based company, which he co-founded in 2012 and now operates in partnership with Managing Director Susie Williams and a remarkable cast of performers blends circus, dance, and physical theater “to create poetic work that is beautiful, deep, relatable and even a bit absurd”. The company has performed internationally and in 2015 received a Seattle CityArtist Projects grant. When asked, in a recent interview, Terry responded to questions about what makes Acrobatic Conundrum different. He said: “What originally started out as a local effort to showcase circus artists doing edgier, expressive work has blossomed into a nationally reputed touring company.” And “I think we’re connected in our aspirations to create vibrant live, athletic theater and perform it.” When asked in what way Acrobatic Conundrum is connected to and stands out from other groups in the world of circus he responded “I think we’re connected in our aspirations to create vibrant live, athletic theater and perform it.” And “Acrobatic Conundrum is different because of our passports. We are a U.S. contemporary circus company, which is a rarity. Also, our work is very ensemble based, and I think the work reflects our process of collaboration, our dedication to making it work together. We are looking forward to what Terry and Susie help bring together for a special Moisture Festival sponsored event at the Broadway Performance Hall that features this wonderfully innovative group.